While pizza is still America’s favorite food, powerful trends in the pizza franchise industry dictate how successful new locations will be. Every second, Americans consume about 350 slices of pizza. 93 percent of Americans (over the age of 2) eat pizza at least once every month and 41 percent eat pizza at least once a week. 3 of the 5 fastest growing restaurant chains in the U.S. last year sold solely or mainly pizza. This isn’t new. Pizzerias have been one of the most popular restaurant categories in the U.S. for years now, and franchise opportunities abound as a result. In fact, the largest pizza chains have carved off a bigger slice of the pizza market pie every year for over a decade now, continually infringing on the market share enjoyed by independent pizzerias across the country. In September of 2015, just the top 50 chains’ market share stood at 55.72 percent. Of course, that doesn’t mean that a new pizza franchise location is a guaranteed cash cow, or that locations that are succeeding today are guaranteed to keep that up in the future. Despite the fact that pizza remains America’s favorite food, the industry is constantly changing. Industry trends can easily spell disaster for a perspective pizza franchise buyer who hopes to rely on the traditional pizza joint model. If you’re considering buying a pizza franchise location, the following industry trends need to factor heavily into your plans. If they don’t, you just may find someone else stealing your slice of the profitable pizza franchise pie. While the steps involved in actually making pizza have been largely unchanged for over a century, how it’s being ordered and delivered has changed dramatically in recent years. Specifically, online and mobile ordering via websites and mobile apps has moved quickly from “nice to have” to “must have” in the minds of most pizza consumers. Fortunately, the technology required is relatively easy and inexpensive to develop, putting it within reach of even small chains and independent locations, so you don’t have to buy into industry dominators like Pizza Hut and Domino's to offer this expected option. And, franchise locations that have invested in online ordering have found it pays for itself relatively quickly. Putting the power of ordering in the customer’s hands, and connecting the site or app to your location’s POS system and delivery queue, serves to increase speed, convenience, customer satisfaction, and revenue simultaneously. The average American pizza lover these days is more conscious than ever of environmental issues, conservation, and sustainable industry practices, and they’re intentionally choosing to support companies that share their concerns and back up that concern with environmentally-conscious action. Millennials, especially, strongly support this trend, which isn’t unique to pizza franchises, but is apparent in nearly all industries. So, every franchise location owner needs to consider, not only how they can take positive steps toward running a more sustainable operation, but how they can let consumers know they’re doing so without coming across as “me too” braggers. Pizza boxes made from 100 percent recycled material, certified organic ingredients, and just about every other identifiable method of shrinking the chain’s (or the individual location’s) impact on the environment will help. In the past, pizza became popular as a fast, tasty, and cheap “meal-on-the-go” that was tailor-made for late night college study sessions, birthday parties, and any other situation where a lot of tasty food was needed, but no one was being overly picky. While that market still exists, the modern pizza lover is often more interested enjoying the experience of high-quality food in a fun environment. As a result, fast-casual pizza chains have seen incredible growth in recent years compared to the more traditional quick service/carry-out/delivery model so popular in the past. 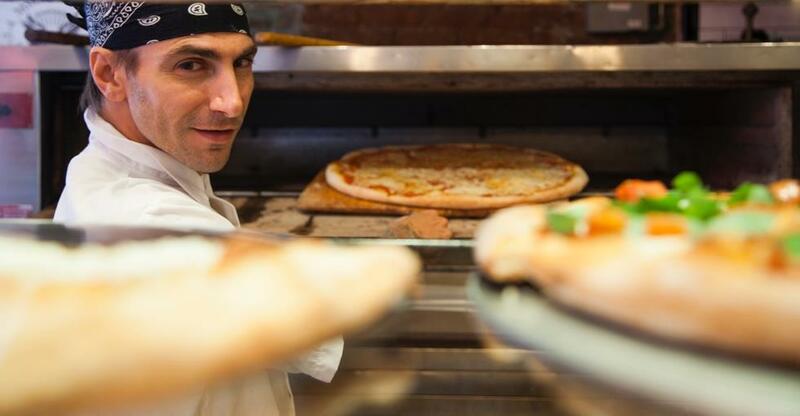 According to Technomic’s annual survey results, fast casual pizza chains saw an impressive 11.5 percent growth in 2015, while the overall industry grew by just 4.1 percent. These locations are usually eat-in restaurants (although carry-out is still a popular option,) with fun, lively, or relaxing atmospheres, and they’re becoming extremely popular among teens and young adults looking for a place to unwind after work or school, enjoy quality food that’s customized to their tastes, and share an hour or so with friends and family. So, do your research before jumping into this particular pizza trend, but don’t be surprised if that’s where signs are pointing in your area. While pizza will probably never reach the status of “health food” in anyone’s mind, adding healthier options to the traditional menu of pizza toppings and ingredients is no longer a question in today’s successful pizza restaurant. It’s a necessity. As reported by Pizza Magazine, new FDA requirements that went into effect in May of 2017 require all chains with more than 20 locations to provide calorie counts and other nutrition information on a per-slice basis for customers to compare. While traditional pizza options (like extra cheese and meat-lover’s speciality pies) could appear shocking to the calorie-conscious, this rule actually puts franchises in an excellent position to appeal to today’s health-conscious consumer by highlighting healthier menu items, and even adding options that haven’t necessarily sold well in the past. While we may still picture a college-aged football fan with a cold beer in hand, the average modern pizza lover is actually an active 20-something woman that works out at least twice a week. She’s interested in enjoying a slice or two as long as it’s not dripping with grease and loaded with calories. To appeal to this target market, the largest chains have been adjusting their menus to include healthier options like gluten-free, fat-free, and non-dairy ingredients, certified organic toppings, and a wider selection of salads and other healthy selections that can complement pizza. If you’ve ever considered buying a pizza joint or opening a pizza franchise location, this is certainly a great time to pursue that dream. The industry is growing at an impressive clip, and very few markets are in danger of saturation anytime soon. If you currently own a pizza franchise location, you should be able to maintain a highly profitable and sustainable business for the foreseeable future. After all, you are cooking up America’s undisputed favorite food. But, that doesn’t mean you can just keep doing what you’ve always done and call it good enough. The American consumer’s tastes and expectations are constantly changing when it comes to how they order and enjoy their favorite food, and those changes are having a significant impact on existing franchises and independent locations alike, nationwide. So, stay alert to changing trends in the pizza industry, and always focus on giving your customers exactly what they want.